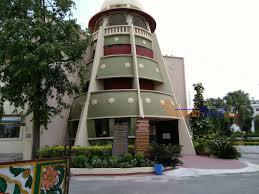 Bhartiya Lok Kala Museum is famous for having a rare collections of articles in the museum. It is located in the building of Bhartiya Lok Kala Mandal in city of Udaipur. This rare compilation varies from typical rural-dresses, ornaments, puppets,masks, dolls, folk musical instruments, folk deities and paintings. Bhartiya Lok Kala Mandal is started to encourage rich local arts and crafts of Mewar region of Rajasthan. The local handicrafts and things of art of Mewar region is world famous and attracted lots of tourism. Bhartiya Lok Kala Museum is one of step which extends their efforts to display the best art and craft of Mewar. In the starting of the museum, there is displaying of the theater objects in a hall. Moving to other hall, a fabulous collection of tribal folk musical instruments and ornaments can be seen. Nearby there is a puppet theater, where one can enjoy watching a puppet show. Puppet show occurs at regular intervals. Moving to the opposite side of theater, there are designs of henna handprints, decorated cow dung floors and terra-cotta devras (small shrines) that come from the village of Molela near Nathdwara. 09.00 am - 04.00 pm. Closed on public holidays.